The Fischbowl: Freakish Final Four? ESPN had over 5.9 million entries to its Tournament Challenge. Only two of them have the final four correct (here's one of the two, the one currently leading the overall challenge). Given what you know about college basketball, the NCAA Tournament, and probability, are you surprised there are two that are correct? Or would you have expected there to be more that were correct? Or less? If you answer, make sure you justify your answer. Well, before doing any calculations, 2 out of almost 6 million seems rather small. I would expect there to be more. I estimated there should be about 90 correct final four guesses: For each division, someone has a 1 in 16 chance of choosing correctly. That's a one in 65,536 chance of getting all 4 correct. 1 out of 65536 is roughly 90 out of 5.9 million. I don't know much about NCAA basketball, but maybe 2 correct guesses is reasonable, considering an 11-seed and an 8-seed made it through to the final four. At first glance I too would have expected there to be more correct. However, after doing some math I think there should have been 2 correct given a pool of 5.9 million. Simply focusing on the final four, complete random chance should yield 1 out of ~3.8 million correct. There are 64 possible choices for the first slot, 63 for the second, 62 for the third, and 61 for the fourth (64*63*62*61 = 15,249,024). Because the order of these four teams does not matter, the probability of guessing correctly is greatly increased. Instead of there being one in 15249024 correct, there are four in 15,249,024 (1 in 3,812,256). Based on 5.9 million entries, pure random chance would yield 1 or 2 correct (5.9 / 3.8 = 1.5). At first glance I thought there should be more but I agree that 2 is about correct, I do not know much about NCAA basketball but calculations show that 2 would be correct. Grrr...I just wrote a really long comment that got lost to the Gods of the Interweb. In short, if every possibly matchup were equally likely, you would expect 90 correct final 4 picks (it's not going to be 64*63*62*61 because there has to be 1 team from each region). That said, I'm sure lots of people picked all 4 #1 teams. So I instead went and looked at the vegas odds (they are, after all, in the business of getting the odds correct). My poor Ohio State Buckeye's had the best odds of making the final four at just oder 50%. Kentucky had the best chance of the remaining teams (13.9%) while VCU's odds were .03%. That's right, play the tournament more than 3,000 times and they are expected to make it once. Together, the chances of all 4 of these teams making it is minuscule (.00000030024%). 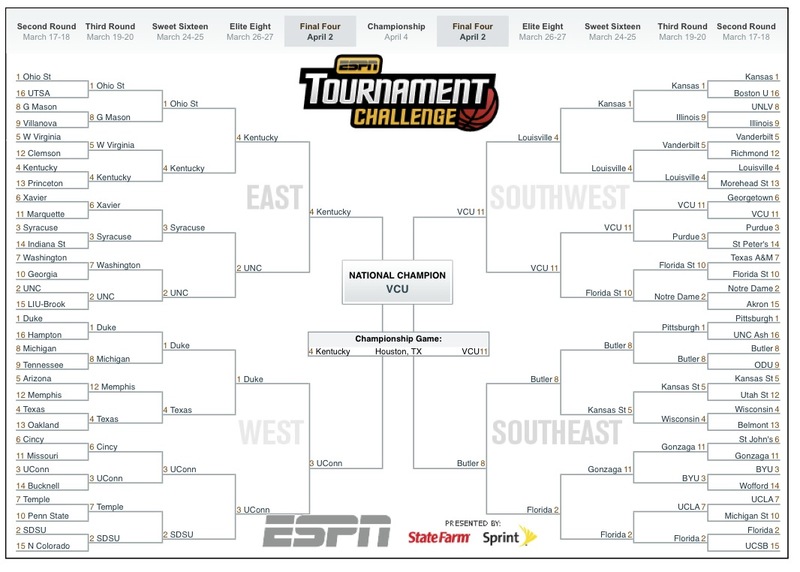 Put another way, you would expect for 1 in 33 million people to pick this bracket. So from that perspective, yes, it's surprising that there are even 2 correct brackets. On the other hand, if you pick all 4 #1 seeds to advance, whoop-dee-doo. You pick VCU, Butler, UConn, and Kentucky? Bragging rights for the rest of your life (and possibly some money too). Avery's use of Vegas odds to predict the number of correct brackets is spot-on. According to the log 5 analysis: a final four containing Butler(1.0%), VCU(.03%), UConn(7.2%), and Kentucky(13.9%) will happen 1 in 33,306,700 times. The mathematical odds match up with the vegas odds almost exactly. Warning: self promotion to follow. Well, I do know a lot about this tournament, but never did I expect that a number 8 and a number 11 seed would be playing the National Championship Game. However, I on the other hand don't fully follow this sport as much as Hockey or Baseball, I had picked these two teams (Butler & UConn) to play, with UConn coming out as the Nat'l Champion. However, I must agree with everyone on here about using different math skills as well as using the vegas odds, which I am sure a lot of people used during this tournament. But as much as I am sure about this, I am sure that some people just used common knowledge. I read, Freakish Final Four, by Carl Fisch. In this very short article, Fisch said that of the nearly 6 million entries for the Final Four results, only 2 were correct. At the end of the article, he asked whether the reader thought this number should have been higher or lower. My answer to this is that I have absolutely no idea. Though I know Mrs. Smith prefers that we pick a side on controversial topics, I really don’t know if this outcome is odd or completely normal. By the way, I know this is not a very controversial topic. But if I had to choose one side, I would honestly imagine that this number would be at least a little bit larger. I find it odd that even though there are probably millions of different possible outcomes for this famous competition due to the fact that 64 different teams compete, that even with the use of logical deduction due to what teams have proven superior in the past only two people guessed correctly. I think this number should be higher by at least 4 charts.